Yuri Aganol® antibacterial floor cleaner is formulated to clean and disinfect the flooring of hard surfaces. The formula effectively lifts stubborn dirt and works quickly so you'll have a clean and shiny floor. It is Enhanced with the scent of flowers and herbs that leave instant freshness in your room. Suitable for all hard floor types: marble, terraso, vinyl, wood, plastic, and others. Available in 5 variants: Lemon Fresh, Floral, Lavender, Morning Fresh with Lemongrass, and Pine Fresh. Volume : 80 ml, 630 ml, 1000 ml, 2000 ml, 3000 ml and 3.7 L.
Yuri Babysoft® is an antibacterial softener for laundry and is formulated with environmentally friendly ingredients. It is ideal for baby and the whole family wash because Yuri Babysoft® has been tested and certified as a dermatologically safe product. it contains an aroma that will make baby clothes feel fresh throughout the day. Volume : 410 ml, 1000 ml and 3.7 l.
Yuri® Bathroom Cleaner is powerful in cleaning dirt like mould, water stains and soap stains on porcelain/ceramic tiles, shower curtains, bathtubs, toilet bowls, washbasins, plastic/stainless steel, marbles, granites, natural stones, wood and varnish, etc.. It also serves as antibacterial and deodorant. Volume: 410 ml and 500 ml. Yuri Biosoft® is a detergent especially formulated for fine clothes such as silk, wool, polyster, fine cotton, etc. Biosoft® consists of environmentally friendly fine detergent materials with pH balanced that preserves the texture of the fine clothes and protects your hands from dryness resulting from frequent washing. Volume : 250 ml, 375 ml and 3.7 l.
Yuri Biosoft® Hijab is a series of laundry care consisting of 3 products: Detergent + Softener, Fragrance + Softener and Easy Ironing For Fabrics each of which is formulated with the same fragrance. Biosoft® Hijab is made from environmentally friendly and fine materials which are mild on hands. Biosoft® Hijab has been passed with ‘HALAL’ certification. Available in 1 variant: Ocean Fresh. 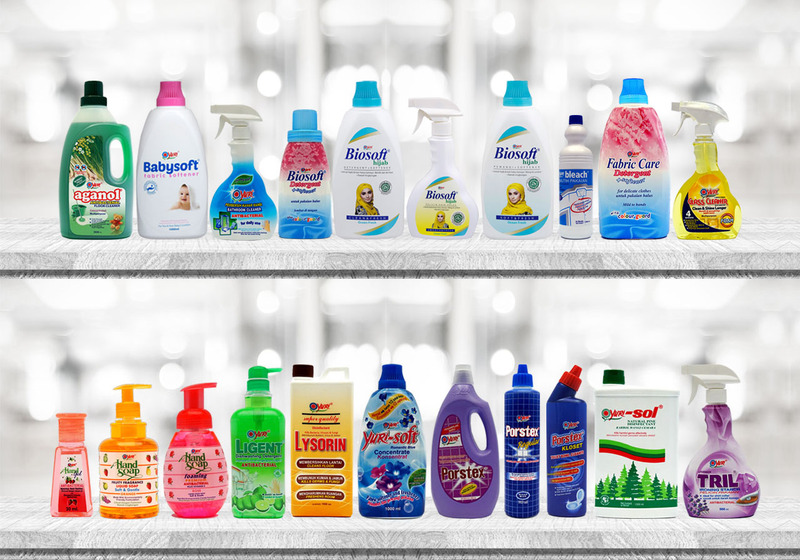 Detergent + Softener is available in 3 volumes: 40 ml, 630 ml and 900 ml. Fragrance + Softener is available in 3 volumes: 10 ml, 630 ml and 900 ml. Yuri® Bleach whitens, removes stains and brightens white cotton clothes. Yuri® Bleach also disinfectants bathrooms, serves as bath water and cleans fruits and vegetables. Please check the direction of use carefully. Available in 2 variants: Lemon Fresh and Morning Fresh. Volume : 1000 ml and 3.7 L.
Yuri® Fabric Care is a detergent especially formulated for fine clothes such as silk, wool, polyster, fine cotton, etc. Yuri® Fabric Care consists of environmentally friendly and fine materials with pH balanced that preserves the texture of the fine clothes and protects your hands from dryness resulting from frequent washing. Volume : 375 ml and 1000 ml. Yuri® Foaming Glass Cleaner cleans surfaces such as glass, mirrors, ceramic plastics, porcelain, wood, stone and stainless steel with 4 features : Streak Free Shine, Cuts Grease & Oily Residue, Removes Dust, Dirt & Finger Marks, Free From Ammonia Smell. Available in 3 variants: Fresh Blue, Lemon Fresh and Fresh Lilac. Volume : 410 ml, 500 ml Foam Sprayer, 500 ml refill and 3.7 L.
Yuri® Hand Gel cleans and kills germs effectively . The moisturizer contained in Yuri® Hand Gel helps prevents dryness of your hands. available in 2 variants: Green Tea and Strawberry. Yuri® Hand Soap contains extracts of fruits that effectively clean your hands and at the same time moisturizes with fresh fruity fragrances. Available in 4 variants: Apple, Orange, Grape, Strawberry. Yuri® foaming Antibacterial hand Soap with its luxurious foam cleans your hands so easily without making them dry or irritating. Enriched with the aroma of green tea and refreshing flowers ,Vitamin E and environmentally friendly ingredients, Yuri® Hand Soap Foaming is an ideal choice for daily use hand soap. Available in 3 variants: Green Tea, Rose and Lavender. Volume: 375 ml and 410 ml. Yuri Ligent® is formulated with effective cleaning power to remove and dissolve grime and fats from your kitchen utensils thoroughly without leaving any smell at all. Available in 3 variants: Lime, Grapefruit and Lemon. Volume: 80 ml, 180 ml, 600 ml, 630 ml, 1000ml and 3.7 L.
Yuri Lysorin® disinfectant is effective for killing germs, viruses and fungi. Yuri Lysorin® can be used for cleaning any hard surfaces and floors, especially in public places such as hospitals, offices, cinemas, even animal cages and ditches. Volume : 630 ml, 1000 ml and 3.7 L.
Yuri-matic® Laundry Liquid Detergent is formulated with environmentally friendly ingredients to clean your laundry from tough dirt and at the same time eliminating sweat smell. Yuri-matic® Laundry Liquid Detergent is also equipped with antibacterial agent to kill germs effectively, anti-redeposition agent to prevent dirt from redeposit back to the clothing fibers and anti-dust mites property which effectively eliminate the causes of allergies and eczema. Luxuriously scented Yuri-matic® leaves your wash more longer lasting in freshness. Its environmentally friendly formulation has been certified by the Green Label Singapore. It has 3 variants: Romantic Blue, Floral and Lavender. Weight : 80 g (Tough Stain), 630 g, 1 kg, 1.8 kg, 2.8 kg, and 3.7 L.
Yuri Porstex® is a powerful cleaning fluid formulated for removing stubborn stains and germs from porcelain and ceramic surfaces instantly. After applying Yuri Porstex®, the surfaces will become as new as before. It is mainly used to clean bathroom tiles, wash basins, bath tubs and floors made of ceramics and porcelains or plastic materialsDo not use on terrasos, marbles, granites, and wooden floors. Pour a small amount of the liquid on the corner of the surface to be cleaned and check the result. Available in 2 variants: WL (Blue) and WB (Purple). Volume : 500 ml, 1000 ml, 2000 ml and 3.7 L.
Yuri Porstex® Kloset toilet bowl cleaner effectively removes stubborn stains, crust and dirt from the toilet bowl surfaces and at the same time kills germs effectively. In just a few minutes, the surface of the closet becomes clean and shiny again. The crooked head of the bottle makes it easy to clean the hard-to-reach areas. Yuri Porstex® Regular is formulated as a powerful cleaning fluid for daily use. It effectively removes stubborn stains from porcelain and ceramic surfaces and kills germs effectively. Yuri Porstex® Regular is ideal for cleaning any porcelain , ceramic and plastic surfaces. Do not use on terrasos, marbles, granite, and wooden floors. Available in 2 variants: Ocean Blue and Fresh Lilac. With just the its half capful , Yuri-Soft® Concentrated Softener will give you extra softness and longer lasting freshness. Yuri-Soft® Concentrate Softener’s antibacterial property and environmentally friendly ingredients give an added bonus for a safer and cleaner wash. Available in 3 variants : Lavender, Floral and Romantic Blue. Volume : 25 ml, 250 ml, 630 ml and 1000 ml. Yuri-Sol® Natural Pine Disinfectant is specially formulated with natural pine oil to disinfect and germicide floor surfaces effectively. Yuri-Sol® Natural Pine Disinfectant can boldly overcome the unpleasant odor in areas such as toilets, hospitals, pet cages, gutters because of the fresh natural aroma of pine oil contained in Yuri-Sol®. Volume: 500 ml, 630 ml and 1000 ml. Yuri® TAF Non-Scratch Cream Cleanser is a surface cleaner with mild abrasive materials with PH neutral for cleaning hard surfaces made of stainless steel, aluminum, chrome plastics, synthetic leather, formica, marble, terraso, vinyl, porcelain, mosaic, ceramic, etc. without leaving scratch marks. Yuri® TAF Non-Scratch Cream Cleanser with its PH neutral property is mild on hands and yet tough on grease and grimes. Available in 2 variants: Lemon & Lime and Fresh Blue. Volume : 500 ml and 3.7 lt.
Yuri® TAF Kitchen Cleaner is a cleaner made specifically for kitchen appliances made of stainless steel, formica, ceramic, porcelain, etc .. Yuri® TAF Kitchen Cleaner effectively removes oil and dirt without leaving annoying detergent foams. Hence, repeated rinsing can be avoided. Volume: 375 ml and 500 ml. Yuri® Toothbrush helps you get the best dental care because of its gentle and yet strong brushes. The brush handle is specially designed to reach up to the very back of adults’ mouth cavity. Yuri TRIL® Ironing Starch equips with ingredients and luxurious scent that helps ironing to be easy, tidy and smooth so that the clothes are nicely scented, fresh and tidy throughout the day. It is most suitable for shirts, dresses and linens made of cotton materials. Available in 3 variants: Floral, Lavender and Romantic Blue. Volume : 410 ml, 500 and 3.7 L.